What the heck is four-color process or what is commonly referred to as full color? Well, don’t feel bad about not knowing or having limited knowledge on the subject. In flexographic printing and digital printing it is good to have a brief understanding of what 4CP stands for and what it can do for your labels. CMYK and full color are both commonly referred to terms in label printing. Full color is not anything special so don't worry about your friends laughing at you for not understanding what it means. It is just a commonly referred to term for 4CP. 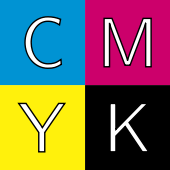 CMYK refers to the colors that are used in four-color process: cyan, magenta, yellow, and black. The true meaning of the K is for Key Plate, however to make things simple let's just refer to it as the black plate. Printing in 4CP allows for the printer to construct any color in the Pantone (PMS) book from these four colors. In doing so it allows the graphic designer who is creating your labels to get way more creative in designing your labels. Side note: if you want a "spot color" then you are referring to us picking an actual PMS number out of the pantone book. If you look in a "bridge" book then you can see the difference between making a color out of 4CP versus using the actual color itself. It is a subtle difference but good to take in to consideration when designing a label. The CMYK process works by partially or entirely subtracting reflective light from whatever surface it is covering. In most cases the surface is white and often times when a Flexographic printer is printing on clear surfaces they will first lay down a coat of white to get a better color reflection, much like a painter laying down a base coat.